Canadian actor Cory Monteith died from a mix of heroin and alcohol in his system, the B.C. Coroners service has confirmed. "Post-mortem testing, which included an autopsy and toxicological analysis, found that Mr. Monteith, aged 31, died of a mixed drug toxicity, involving heroin and alcohol," said a statement release by the coroner on Tuesday afternoon. "It should be noted that at this point there is no evidence to suggest Mr. Monteith’s death was anything other than a most-tragic accident." Monteith, 31, was found dead by staff at the Fairmont Pacific Rim on Saturday afternoon when he failed to check out of the hotel. Vancouver police said because Monteith died alone in his hotel room there was no reason for any further police investigation, including attempting to identify and arrest the dealer who supplied the actor with the drugs. "There is an inherent risk when you are using illegal drugs and there is nothing in these circumstance for police to investigate further," said Const Brian Montague. "Unfortunately a mixture of alcohol and heroin can be fatal and this is another example of a tragic overdose. From the police perspective this investigation has been concluded," he said. Police interviewed all three people who were out with Monteith the night before, and said the man and two women had co-operated with investigators. "We are pretty confident we know where they were," said Montague. But he said police would not be releasing the names of the establishments. He said police suspected from the beginning that Monteith died from a drug overdose, because of evidence found in the room, but he would not specify what that evidence was, or how police believed Monteith ingested the drugs. Montague said there was no information in the coroners statement to indicate Monteith may have overdosed because of a "bad batch" of heroin. "The coroners report doesn't suggest levels of alcohol and heroin, it just indicates that it was heroin and alcohol that killed Mr. Monteith." 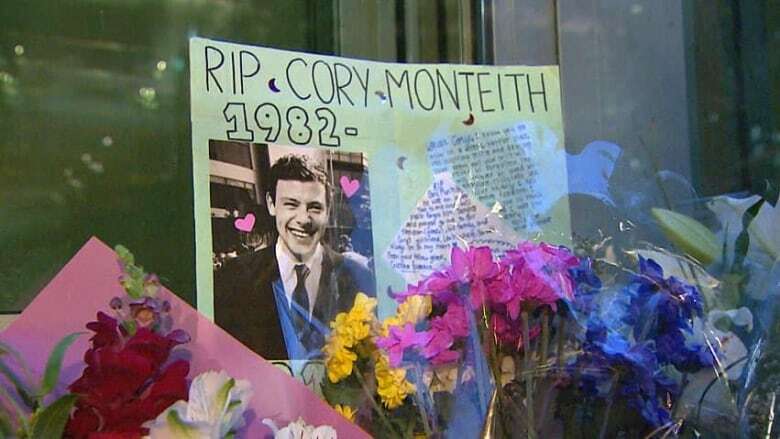 Andrew McIlroy, a Vancouver acting coach who was Monteith's longtime friend and teacher, tried to find meaning in the star's death. "I have an enormous respect for the insidiousness of the disease and an equal measure of compassion for its victims," McIlroy told CBC News in an e-mail. "If one of Cory's beautiful fans thinks twice about that pill or joint or drink, then let us consider that a great 'step one' measure of our respect for his legacy." Monteith was born in Calgary and raised in Victoria, before moving to Nanaimo and then Vancouver. He rose to fame on the Fox television show Glee, where he played high school quarterback Finn Hudson, who joined the school's Glee club. Despite his success, Monteith struggled with drug addiction since he was a teenager, and checked in to a rehab facility in April. In 2011, he told Parade magazine he was "lucky to be alive."